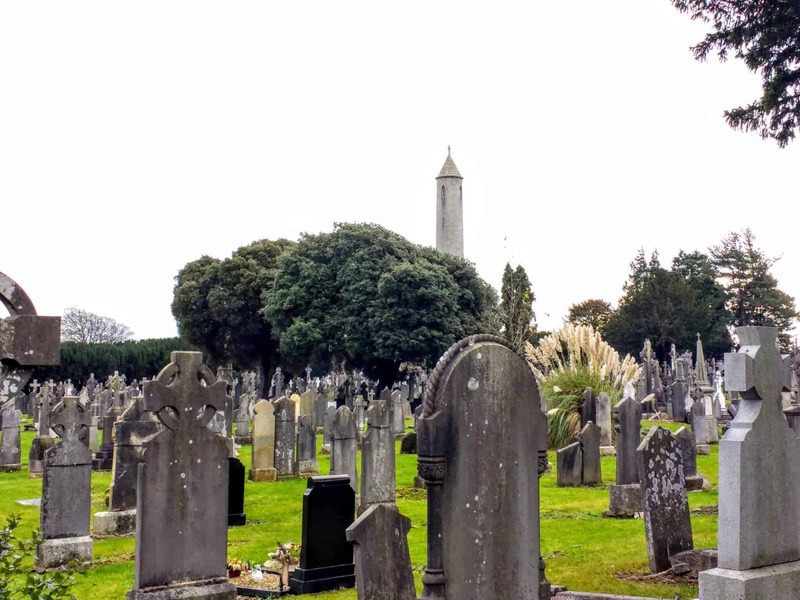 Visiting Glasnevin Museum and Cemetery in Dublin is something that many people want to see as it is sacred ground for many of the Irish heroes and heroines of the Uprising. Glasnevin Museum & Cemetery is also a central location for those wanting to trace their Irish ancestors. The cemetery is free to visit and wander around the grounds. There are maps available at the front desk for those interested in a self-guided tour. 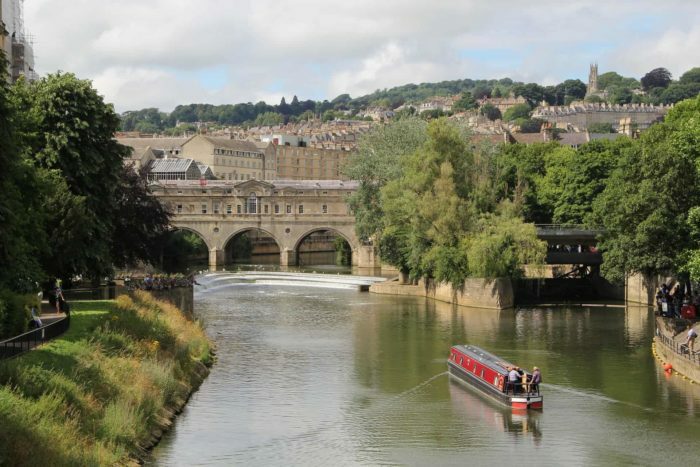 However take advantage of the guided tours that are available as you will learn far more than you ever anticipated. Admission to the Glasnevin Museum is €4.50 there is a really interesting display about the 1916 Uprising to see. If you want a tour of the cemetery and entrance to the Museum it’s €10. This is a great deal as it includes a tour of the graves of Michael Collins, Eamon De Valera and many more from Ireland’s history. 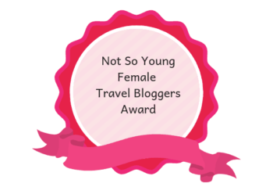 The ticket does include entry to the Museum and a €5 voucher towards your genealogy searches. If you have a relatives or ancestors buried at Glasnevin but aren’t sure exactly where – just ask at the desk, as long as you have the full name and date of death they will more than likely be able to look it up on the computers and provide you with a map to the grave. 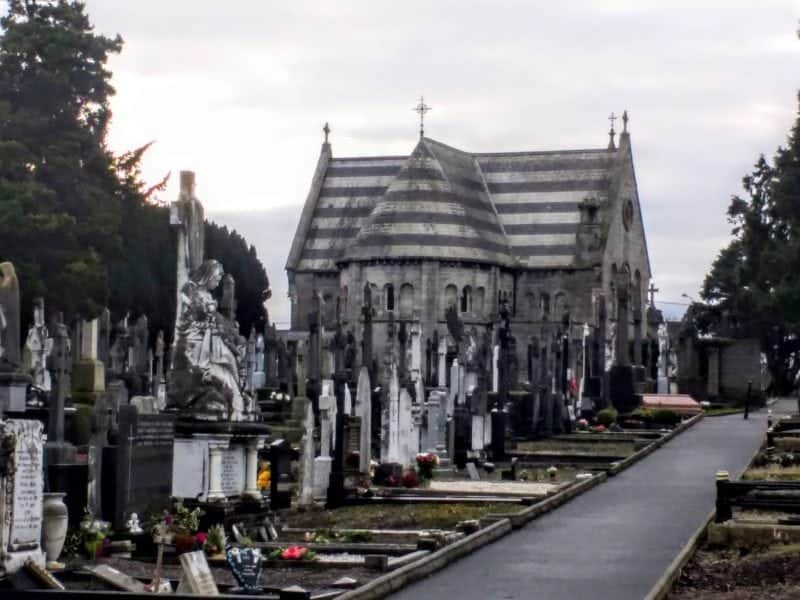 Dublin’s Glasnevin Cemetery is not just a burial ground it is also a suburb of Dublin. In the 6th century, Saint Mobhi established a Monastery here, and a village grew up around it. The Holy Faith convent now stands on the site of Glasnevin House, which was home to ship-owner Sir John Rogerson. Dean Swift went into hiding in an outhouse at Delville, home of the Delaney’s, together with the printing press that published his controversial Drapier’s Letters. Mary Delaney, a supporter of the local weaving industry, visited Dublin Castle dressed from head to toe in Irish lace and linen as a protest against linen and lace tariffs. These are all famous figures in Irish history that lived in the village of Glasnevin. Glasnevin is also home to The National Botanical Gardens, with its beautiful historic glasshouses that date back to 1795. The flower, which inspired Thomas Moore’s “Last Rose of Summer”, is said to bloom still near the main entrance gates. The gardens were built originally to study agriculture but by the 1830’s the pursuit of botanical knowledge had overtaken the original purpose. Plants began to arrive from around the world and relationships were built with Kew Gardens and the Edinburgh Gardens. In 1992, a new program of restoration was put into place and the gardens were refurbished and amagnificent restoration of the Turner Curvilinear Range of glasshouses wascompleted for the bicentenary of the Garden in 1995. Glasnevin Cemetery is the resting place of many Irish. From the unmarked mass graves of nearly 800,000 who dies during the Great Famine and the Cholera epidemics of the 1800’s to many of those who shaped the Republic’s history. Glasnevin Museum is the repository of all the information on those that are buried here, which number over 1.5 million. The Museum shares the stories and history of Ireland in beautifully laid out exhibits and they are immensely helpful when searching for a grave or doing a genealogy search for your family history. 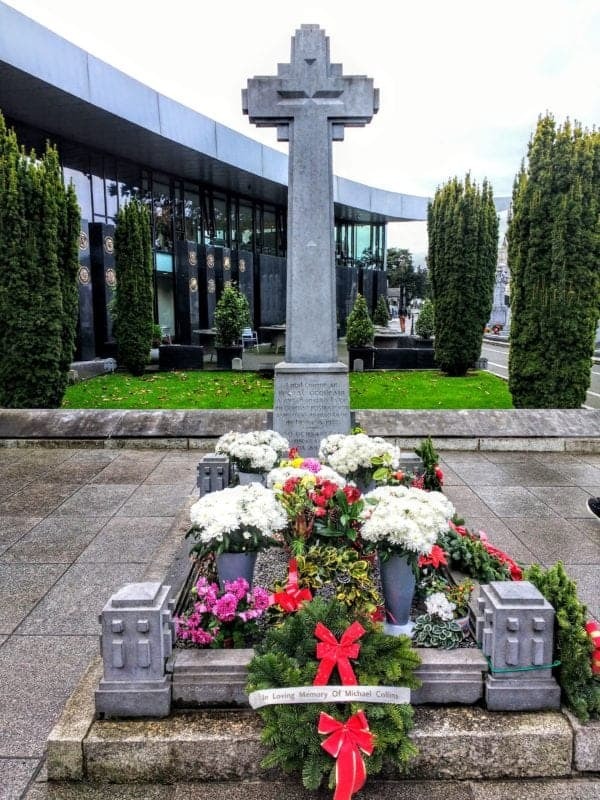 Glasnevin Cemetery is also the final resting place of many famous Irish people. 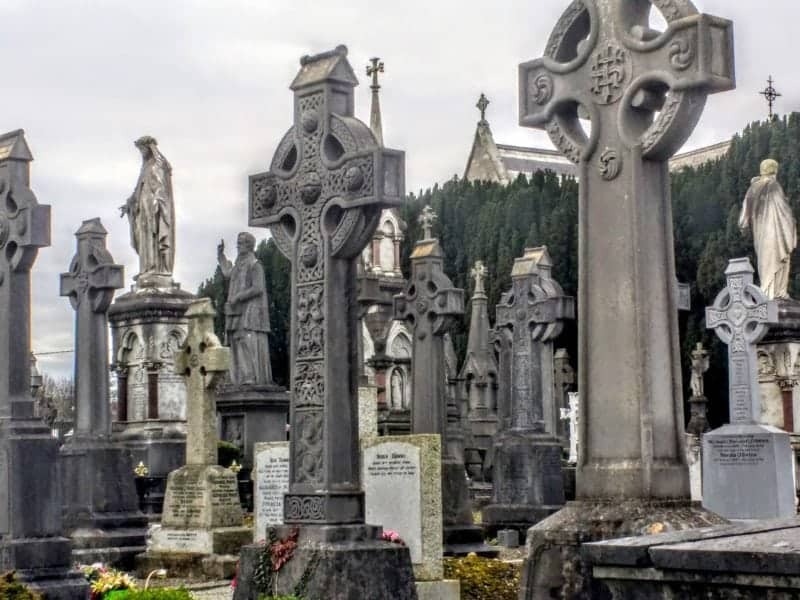 Opened in the 1830’s with high stonewalls and seven watchtowers that were manned by armed guards to deter body snatchers, the cemetery is a ‘Who’s Who’ of key historical figures in Ireland. Why not visit some of Ireland’s famous haunted castles! Daniel O’Connell – known as the “Great Liberator,” O’Connell was an Irish political leader and a campaigner for Catholic Emancipation and the repeal of the Act of Union. Charles Stewart Parnell – was the founder and leader of the Irish Parliamentary Party. Maud Gonne – Maud was won over to the cause of the Republic and was imprisoned as a rebel leader but she was an English actress originally. Éamon de Valera – deeply involved in the Republic’s fight for independence Éamon was the founder of Fianna Fail and Ireland’s Prime Minister and President. Brendan Behan – Imprisoned for his IRA activity, Brendan was one of Ireland’s finest poets, novelists and playwrights. Michael Collins – the founding father of the Fine Gael party and an Irish revolutionary leader who was killed in an ambush in 1922. Constance Markievicz – a suffragette and revolutionary Constance was the first woman elected to the UK’s House of Commons. You can see Constance’s home in Sligo when during the area. Christy Brown – The famous Irish writer and painter with cerebral palsy, played by Daniel Day-Lewis in the film My Left Foot. Luke Kelly was one of Ireland’s greatest folk singers in The Dubliners. Arthur Griffith the founder of Sinn Fein and a leader in the new Free State. 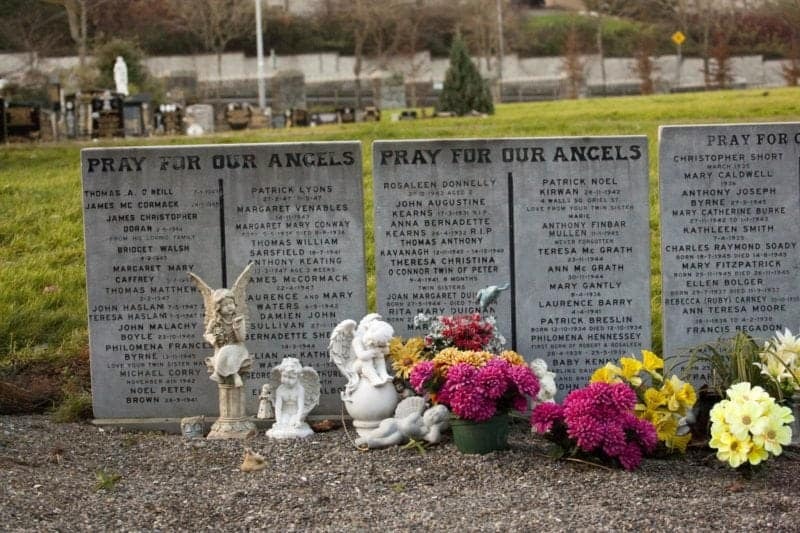 Before Glasnevin was founded, the Irish Catholics had no cemeteries to bury their dead and the repressive Penal Laws placed ridiculous restrictions on the performance of Catholic services. In 1823 at St. Kevin’s Churchyard, a Protestant Sexton took to reprimanding a Catholic priest for performing a version of the funeral mass. A public outcry at this led to Daniel O’Connell launching a campaign for a burial ground for Catholics so they could have a dignified burial. Glasnevin Cemetery was consecrated and opened to the public in 1832. The cemetery was initially known as Prospect Cemetery originally covering nine acres the cemetery has now grown to approximately 124 acres. The Irish call it the ‘dead centre’ of Dublin. The high wall with watchtowers surrounding the main part of the cemetery was built to deter body snatchers, who were active in Dublin in the 18th and early 19th centuries. The watchmen also had a pack of bloodhounds who roamed the cemetery at night. In the mid-1800s a tower was built to commemorate Daniel O’Connell’s death The building of the tower to commemorate O’Connell’s death, funded by public subscriptions and designed by George Petrie. The tower was bombed by loyalists in 1971 and has recently undergone a reconstruction of the internal staircase that was destroyed in the attack. The Tower has now been re-opened and restored after the attack. The tower itself survived the blast, thanks to the three-foot-thick granite stones of its construction. 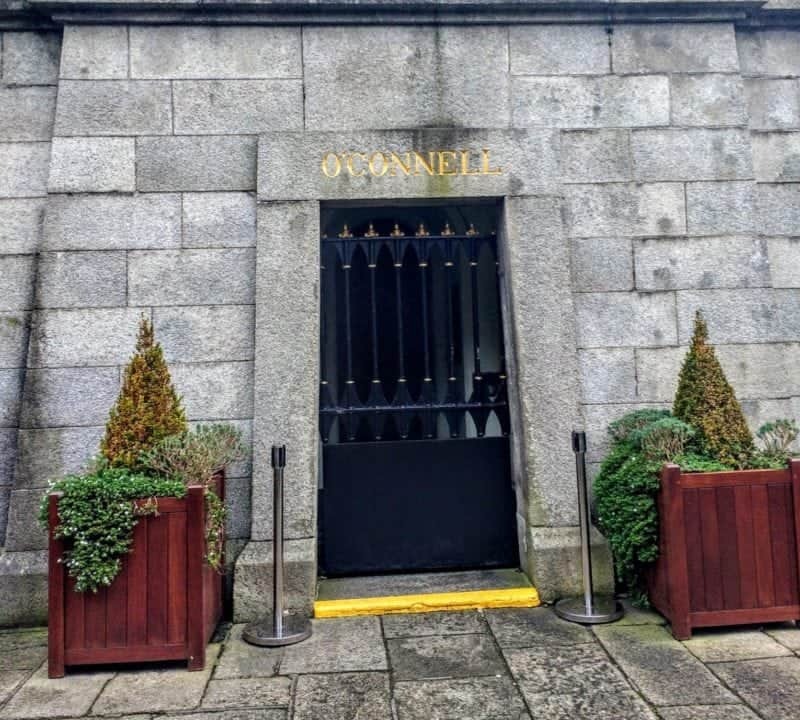 However, with the windows and stairs blown out, it was sealed up, including the crypt at the bottom which contains the sarcophagus of Daniel O’Connell and the remains of several members of his family in a side chamber. From the Irish Times. Don’t forget to make a visit to the John Cavanagh or Gravediggers Pub reputed to be the best pub in Dublin and you may see a celebrity or two hanging out there. You should also take a moment to check out The Bodysnatcher’s Watch Tower the watchtowers were set up in the 1800s to prevent the unscrupulous from digging up the bodies for medical science at the time. Glasnevin’s Watch Towers were a fine selling feature back in the day and no bodies were ever reported being snatched from the graveyard. 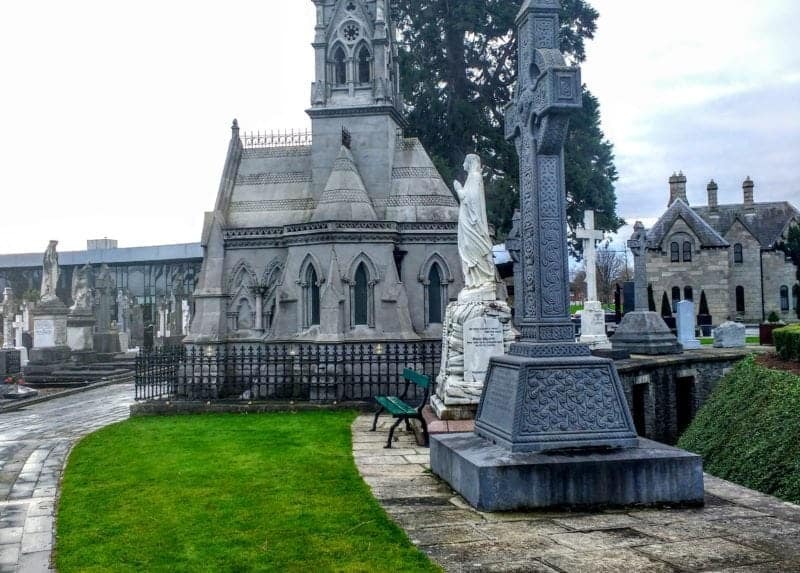 Want to find a few hidden gems to visit outside Dublin and Glasnevin? You can’t miss the serenity and peaceful cemetery at Monasterboice, home to some of Ireland’s greatest Celtic crosses. Glendalough and the Wicklow Mountains are a day trip you don’t want to miss, check out the filming locations for Braveheart and TV’s The Vikings show. No visit is complete without a day trip to some of these amazing heritage sites just outside Dublin. Newgrange is a must do for anyone visiting Ireland – imagine celebrating the solstice with your pagan ancestors this is an incredible experience for anyone. 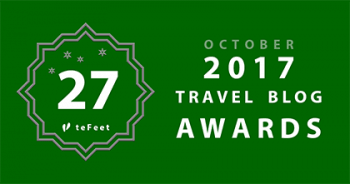 So, do you have a favourite spot to visit in Ireland?